Whoever works on the timber can not remove and it should not be mistaken because the return is prohibited. We must therefore bear in mind exactly what you want to achieve and work on a large piece is even more risky that the goal is complex and difficult to reach final equilibrium. Bring forth a form of matter that is not an accurate representation but still recognizable to blow is a recognized quality artists. Zoomorphic masks African accentuate the characters without falling into caricature. The great elephant mask from Cameroon have much larger ears, their trunks very long but they are realistic. The open mouth on the teeth, we imagine a loud cry. And the general attitude expresses the power and might. Considered a royal animal, a privilege of a few lineages, the elephant masks, carried horizontally, appear only rarely in the masquerades and they go last on the dance venues. Bamileke elephant masks and hoods are beaded to the more abstract. They are recognizable by their large ears flat and we must consider that the long anterior descending to the feet is a mistake but there is no representation of defense and the face is very human characters. They are cons beautifully decorated with beads arranged in geometric patterns. These are worn by members of the society of the elephant under the command of the king, the fon. 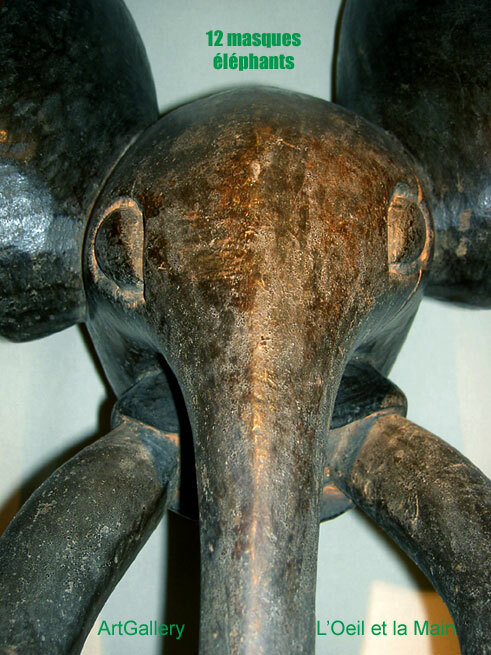 In contrast to the achievements of Cameroon zoomorphic masks Izzi elephants are complex compositions and particularly fantastic or only careful study can discern the features of the animal. Trompe shortened slightly curved tusks and ears are present, but external factors such as the nose appear. At the rear, a head or a face to the oval mouth with teeth, is shown placed in a geometric pattern. These masks whose size varies depending on the size of their dancers characterize classes of age. The largest are well worn by the former class. They embody the spirits of the most important and most formidable.